Amsterdam, 8 December 2016 – The community School of Brunssum opened this school year. 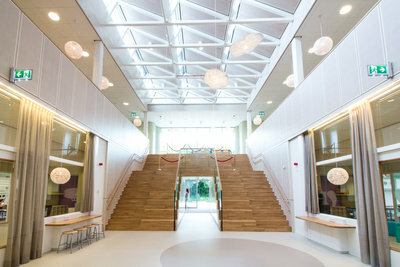 The school, situated in the municipality of the same name in the province of Limburg, has a surface area of 3600m2 and houses two primary schools, a kindergarten, a preschool, a childcare facility, out-of-school care and two gymnasiums that are also being used by the surrounding neighbourhood. D/DOCK was responsible for the Total Engineering of the design of this school in the period from 2012 to 2016. By order of Weller Wonen, D/DOCK developed the design for this new building, in cooperation with KOW, Huisman van Muijen and Van de Laar. Francesco Messori, Design Director at D/DOCK. 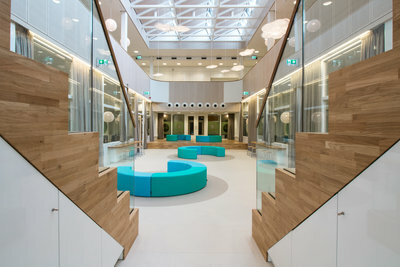 D/DOCK’s Learning Environment was at the basis of the design, in which three layers of privacy connect the various types of education in the building. The first layer aims at guaranteeing a feeling of safety for the child. In the second layer, this safety is combined in an intermediary zone, which is the space just outside the classroom, with functionalities like playing and learning together. The third layer ‘out in the open’: the central auditorium of the building, where people get together. This system of layers offers children the opportunity to find a place that they like best at a specific moment and thus to break with an important dogma: that of the traditional classroom seating. This allows for smaller so called 'learning studios' because the other spaces can be counted to the teaching area, even the central auditorium can be used to this end. 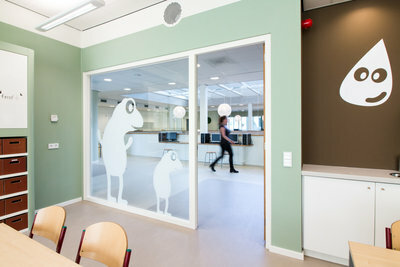 The spaces are furnished solely with fixed elements, which offer enough space to put away all teaching materials. This creates a placid classroom, but in particular it creates unity among the learning environments. “A gentle and friendly environment with an inviting atmosphere”, says Irene Snel, Senior Interior Designer at D/DOCK. 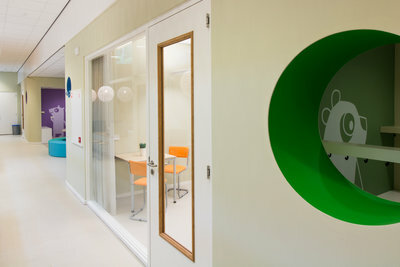 The younger pupils and the older pupils both have their own entrance, the preschool and the day-care facility have their own entrance as well. This results in the building not having a front and a backside, but rather being accessible from all sides. The large quantities of glass in the façade and the roof and the carefully chosen fixtures that create light, pleasant rooms, are the real eye catchers of this building. In order to make the school into a pleasant, friendly place, we have used a lot of organic shapes, a trademark feature of D/DOCK. The same is true for the use of colours: a neutral basis with soft and warm tones, supplemented with playful patches of colour. We have used soft and touchable materials, in contrast with many other schools, without losing track of maintainability. “We should raise and surround our kids with beauty and nuance. Adults value this too, so why wouldn’t kids? It is time we start taking them seriously”, Messori says. “In our colourful, new community school, professionals can work together in an adequate way. The child can develop from age 0 to 12, from an infant to a toddler, under one roof. It is a place where we can offer the children in this neighbourhood quality education and optimal care and support. It is an important impulse on their path to secondary education. 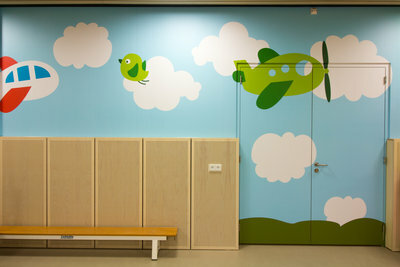 Both the interior and the exterior of the building are child-friendly and stimulating. At each official opening, people noticed that there is a clear coherence and that it is visible that the interior architect has thought out everything very thoroughly. When the 450 children start their lessons at 8:30 in the morning, you’ll notice that it’s very quiet in the building, and that’s because of the quality, sustainable isolating materials that have been used in the building. “This building facilitates the acquiring of ‘21st Century Skills’ very well”, says Maria Pastoor, Chairwoman Community School Brunssum.